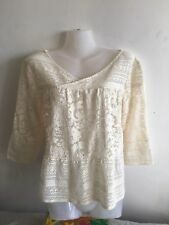 Ladies gorgeous cream lace top. A pretty lace top in superb condition. ANTHROPOLOGIE Kailana Flutter-Sleeve Top. Ivory. Size L. New With Tags. ANTHROPOLOGIE Kailana Flutter-Sleeve Top. Flutter sleeves. In light of these inspirations, it's no surprise that their collection is structured yet delicate, a representation of beauty and strength at once. CRESSIDA KEYHOLE MAXI DRESS BY JILL STUART. By Jill Jill Stuart. Side zip with hook-and-eye closure. Design Features Keyhole. Style Maxi Dress. Co lor: Ivory. Occasion Cocktail, Wedding, Bridal, Formal. PIECED LACE COWLNECK TOP. Color Ivory. Material Nylon. Size Type Regular. Sleeve Length Long Sleeve. LORETTA IVORY LACE TOP. Color Ivory. Size Type Regular. SIZE SMALL. Sleeve Style Dolman Sleeve. Style: Winter blazer, pleated, decorated. Colour: Cream. Material: 52% viscose, 48% wool. After that period an automatic unpaid item case will be opened. We will never mislead you on purpose. They are carefully taken and written down correctly to avoid any inconveniences for both parties. Length 24". Pattern Floral. Color IVORY/GOLD. Neckline V-Neck. Style Knit Top. Beautiful Beach Treasures print. Shade Ivory. Style Tea Dress. Material : 100% Polyester. Dress Length Knee-Length. Material Polyester. Pattern Print. Side zipper. Eri Ali knit top. long sleeves in a cream color fabric cowl neck. machine wash. sleeve: 56cm. Sleeve 12" from pit to cuff. Size: UK 6-10. (albeit just one small stain). Length 25" from back of neck to hem.